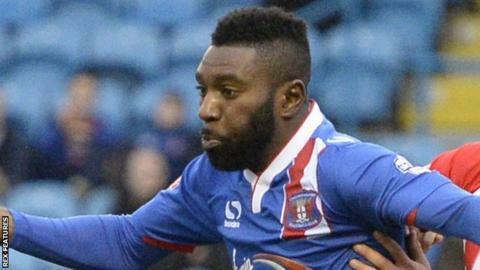 Carlisle United striker Jabo Ibehre has had the red card he received after 34 seconds against Accrington overturned. Ibehre was dismissed for a high boot on Matty Pearson but an FA panel rescinded the sending off after a club appeal. "It goes without saying that we think the correct outcome has been reached," boss Keith Curle told the club website. "Ultimately we had to play over 90 minutes with only 10 men, but that's been and gone now. The positive to come out of it was how the team responded."